LAS CRUCES, N.M. – They are majestic animals, weighing 400 to 500 pounds, their straight black horns 30 to 40 inches long. Their faces are adorned with distinctive black-and-white masks, and they stare at you as if deciding whether to run. They are oryx gazelles, from the Kalahari region of Africa. But this is the Chihuahuan Desert of southern New Mexico, where the animals have been multiplying since 1969, when the New Mexico Game and Fish Department released oryx as part of its exotic animal introduction program on the White Sands Missile Range. The idea to provide exotic big-game hunting opportunities for local hunters originated just after World War II with Frank C. Hibben, today professor emeritus of archaeology at the University of New Mexico, but then chairman of the New Mexico Game Commission. Mustered out of the Navy in the Mediterranean, Hibben had hunted oryx in the Atlas Mountains in northwest Africa, an area that resembled his adopted state of New Mexico. Hibben believed there was a “niche” in the Chihuahuan Desert that would support a large ungulate. Years later, he paid for and helped to trap 18 oryx which, after quarantine, were shipped from Africa to New Jersey and then on to the Albuquerque Zoo. Under federal law, the original animals had to spend the rest of their lives confined at the zoo, but their offspring were released onto White Sands Missile Range, a 2.2 million-acre parcel of property. Studies conducted in the 1960s by wildlife-management scientists at New Mexico State University in Las Cruces suggested that the oryx would be successful, but nobody knew just how far they would spread – or how many problems they would cause. Between 1969 and 1973, 93 oryx were released onto the missile range – and quickly began to reproduce. Researchers believed that the population would never grow beyond 500 to 600 and would remain within the Tularosa Basin. However, the animals proved to be extremely opportunistic, and quickly spread into the San Andres Mountains. Some observers estimate the current oryx population at 5,000 or more, and animals have been spotted from 60 miles south of Albuquerque all the way down to West Texas. Since 1974, hunters have killed approximately 5,000 oryx, says Morrow. 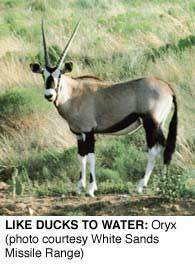 The first year, the missile range and New Mexico Game and Fish issued only four hunting permits for oryx. This year, the agencies will issue 895 once-in-a-lifetime permits, and Game and Fish will issue 500 year-round permits for hunts off-range. Animals are like people. They all want to come to the United States whether brought as slaves, illegal aliens, or dreamers. Now President Trump must include the oryx in his immigration policy. Eventually all animals and all kinds of people will be included. America will be inundated with animals and people, and old America will be lost forever. So much for a citadel of democracy with a Statue of Liberty offering sanctuary to all people and animals with an outstretched hand offering sanctuary to “the poor, the destitute, and downtrodden” because America will become just another third world nation in a world of third world nations.